Flow on an edge doesn’t exceed the given capacity of the edge. Incoming flow is equal to outgoing flow for every vertex except s and t.
the maximum s-t flow is 19 which is shown below. Max Flow Problem Introduction : We introduced Maximum Flow problem, discussed Greedy Algorithm and introduced residual graph. Ford-Fulkerson Algorithm and Edmond Karp Implementation : We discussed Ford-Fulkerson algorithm and its implementation. We also discussed residual graph in detail. Time complexity of Edmond Karp Implementation is O(VE2). In this post, a new Dinic’s algorithm is discussed which is a faster algorithm and takes O(EV2). A flow is maximum if there is no s to t path in residual graph. BFS is used in a loop. There is a difference though in the way we use BFS in both algorithms. In Edmond’s Karp algorithm, we use BFS to find an augmenting path and send flow across this path. In Dinic’s algorithm, we use BFS to check if more flow is possible and to construct level graph. 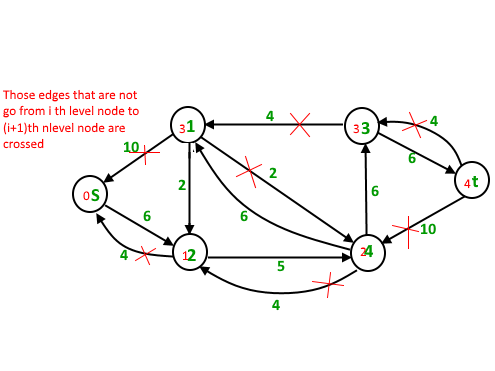 In level graph, we assign levels to all nodes, level of a node is shortest distance (in terms of number of edges) of the node from source. Once level graph is constructed, we send multiple flows using this level graph. This is the reason it works better than Edmond Karp. In Edmond Karp, we send only flow that is send across the path found by BFS. 1) Initialize residual graph G as given graph. a) If more flow is not possible, then return. (in order) from s to t.
A flow is Blocking Flow if no more flow can be sent using level graph, i.e., no more s-t path exists such that path vertices have current levels 0, 1, 2… in order. Blocking Flow can be seen same as maximum flow path in Greedy algorithm discussed discussed here. First Iteration : We assign levels to all nodes using BFS. We also check if more flow is possible (or there is a s-t path in residual graph). Now we find blocking flow using levels (means every flow path should have levels as 0, 1, 2, 3). We send three flows together. This is where it is optimized compared to Edmond Karp where we send one flow at a time. 4 units of flow on path s – 1 – 3 – t.
6 units of flow on path s – 1 – 4 – t.
4 units of flow on path s – 2 – 4 – t.
After one iteration, residual graph changes to following. Second Iteration : We assign new levels to all nodes using BFS of above modified residual graph. We also check if more flow is possible (or there is a s-t path in residual graph). Now we find blocking flow using levels (means every flow path should have levels as 0, 1, 2, 3, 4). We can send only one flow this time. Third Iteration : We run BFS and create a level graph. We also check if more flow is possible and proceed only if possible. This time there is no s-t path in residual graph, so we terminate the algorithm. // of a directed edge u-v. "From"
// index in adjacent array. // we can quickly find it. // Finds if more flow can be sent from s to t.
// Also assigns levels to nodes. // level array works as visited array also. // times for a single call of BFS. // start : To keep track of next edge to be explored. // Traverse all adjacent edges one -by - one. Time Complexity : O(EV2). Doing a BFS to construct level graph takes O(E) time. Sending multiple more flows until a blocking flow is reached takes O(VE) time. The outer loop runs at-most O(V) time. In each iteration, we construct new level graph and find blocking flow. It can be proved that the number of levels increase at least by one in every iteration (Refer the below reference video for the proof). So the outer loop runs at most O(V) times. Therefore overall time complexity is O(EV2). This article is contributed by Nishant Singh. If you like GeeksforGeeks and would like to contribute, you can also write an article using contribute.geeksforgeeks.org or mail your article to contribute@geeksforgeeks.org. See your article appearing on the GeeksforGeeks main page and help other Geeks.